WIMBLEDON, England - Andy Roddick has never been one to doubt his abilities to contend for major fast court titles, even though he has not reached the semifinals of a major since his dramatic run to the 2009 Wimbledon final. Do not tell America's leading male player since 2003 that he's just an afterthought behind the so-called Big Four of Rafael Nadal, Novak Djokovic, Roger Federer and Andy Murray. Only two of those men, six-time Wimbledon winner Federer and two-time winner Nadal, have reached the Wimbledon final. Roddick has done it three times, when unfortunately on every occasion, he came up against the Swiss maestro. "I can make the semis or finals. I've done it before. They're playing great tennis. You can point at any one of them and certainly compliment their pedigree. Seems like they're all in form right now, which isn't always the case. I mean, they deserve all the credit and attention they get right now. [But] I feel healthy. I know what it takes to go deep at this tennis tournament." Roddick has proven that time and time again at the green lawns, but last year he admitted to playing one of his worst Grand Slam matches ever in the fourth round when Yen-Hsun Lu stunned him. The Austin resident had been hearing all tournament long about the positive emotions he had created and the new fans he had won in his heartbreaking 5-7, 7-6, 7-6, 3-6, 16-14 loss to Federer in the 2009 final. That ended at twilight, and was arguably the best match Roddick has ever played in defeat. Fans still recall that match to this day as it without question one of the most well played and dramatic finals ever in the Open Era, right up there with Bjorn Borg's legendary victory over John McEnroe in the 1980 final, as well as the 2008 cliffhanger between Rafael Nadal and Federer that the Spaniard won 9-7 in the fifth set. "I get asked about it a lot," Roddick said. "But that was one of the most enjoyable tournaments I ever had. I'm not trying to forget it. If there was a major event in your life, you probably wouldn't forget it. I didn't need to play that match to know that I could play on grass. It's something that I feel like I can do pretty well. I understand a lot of the nuances of it. I made runs in the Slams before. I'm healthy for the first time in a while. I don't feel like I'm compromising my game right now. So I feel good about where I'm at." After a fairly healthy stretch from 2002-2009, the now 28-year-old Roddick has had a rough stretch health wise during the past two years, both contending with illness and injuries and rarely being able to get in a few months of consistent play as he always seemed to be trying to overcome some sort of physical problem. "I feel like I've been stopping and starting a lot; then playing through something," he said. "There's been a lot of those decisions: Do you go or shut it down and get it right? I've done both. You know, I don't know if there's a perfect solution." This year, he's only won title, Memphis, and was contending with a shoulder injury from March through May.That's not a problem that a huge server wants to have, but he's felt much better during the past few weeks and is confident that the injury is manageable. When he first burst onto the pro scene at the beginning of this century, there were those who thought he would never last long because of his quick, right-arm powered service motion, but that wing has held up pretty well. Roddick is more of a smart server than he once was and tries to emphasize placement over power, but he can still whip a flat serve when needed to. He's content that he's never had to radically change his motion. "I wasn't stupid about that," he said. "I knew that that was where I was going to make my living. I hired my trainer, Doug [Spreen who once worked with Pete Sampras], at a young age before it was like the thing to do. I think I was 20, 21 and had someone full time. Every match we ice it, we work on it. It still feels good. I had a couple little blips. But considering the popular prediction back in 2001 when I was first here, I feel like I've gotten you guys by about seven or eight years now." Roddick has looked good in his first two matches at Wimbledon, defeating Andreas Beck 6-4, 7-6, 6-3 in the first round and then belting Victor Hanescu 6-4, 6-3, 6-4. He will likely have a tougher task on Friday when he goes up against Spanish serve-and-volleyer Feliciano Lopez, a former Wimbledon quarterfinalist, in what could be a preview to the United States’ July 8-10 Davis Cup clash against Spain in Austin at the University of Texas. But while Lopez troubles almost anyone with his suffocating style, he has never beaten Roddick in seven attempts. Just two weeks ago, the American bested Lopez on grass at 2011 Queens in a 7-6(2), 6-7(5), 6-4 victory. Roddick knows that a three out of five set match on Centre Court is different, but has been there and won those, while Lopez is still looking for a major breakthrough. 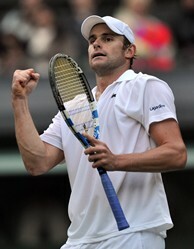 "Queen's was big," said Roddick, who ended up losing to Andy Murray in the semifinals. "I was down a break in the third set to Lopez. Going out there first round would not have been good, but getting four matches there I think was necessary. I felt like I hit the ball great there. I feel fine now."